Epoxidation is treatment where an electrophilic oxidizing agent is capable of introducing a single oxygen atom to connect to both carbons of a double bond. This produces oxacyclopropanes (or epoxides), which may, in turn, be converted into vicinal anti diols. The most widely used reagents for conversion of alkenes to epoxides are peroxycarboxylic acids which deliver oxygen atoms to double bond. For use in the research laboratory, m-chloroperoxybenzoic acid (MCPBA) is common reagent. The magnesium salt of the monoperoxyphthalic acid (MMPP) is an alternative and it is used for large-scale and industrial purposes. Peroxyacetic acid, peroxybenzoic acid, and peroxytrifluoroacetic acid also are used frequently for epoxidation. All of the peroxycarboxylic acids are potentially explosive materials and require careful handling. The OH group of peroxycarboxylic acids contains electrophilic oxygen. These compounds react with alkenes by adding this oxygen to the double bond to form oxacyclopropanes (epoxides). The other product of the reaction is a carboxylic acid. 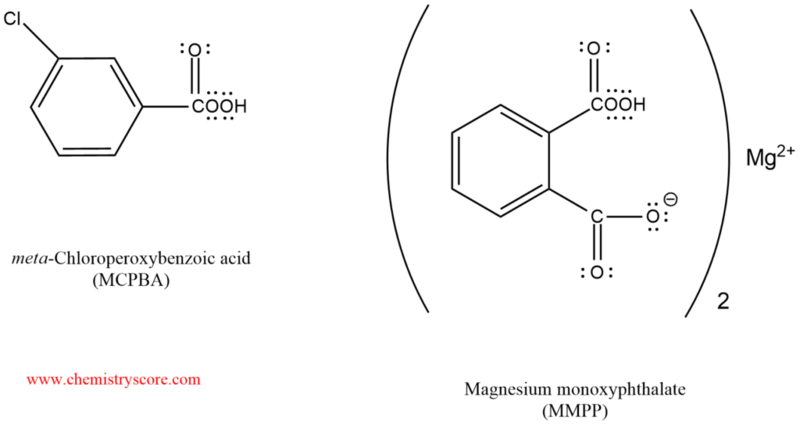 The transformation is of value because, as we know, oxacyclopropanes are versatile synthetic intermediates. 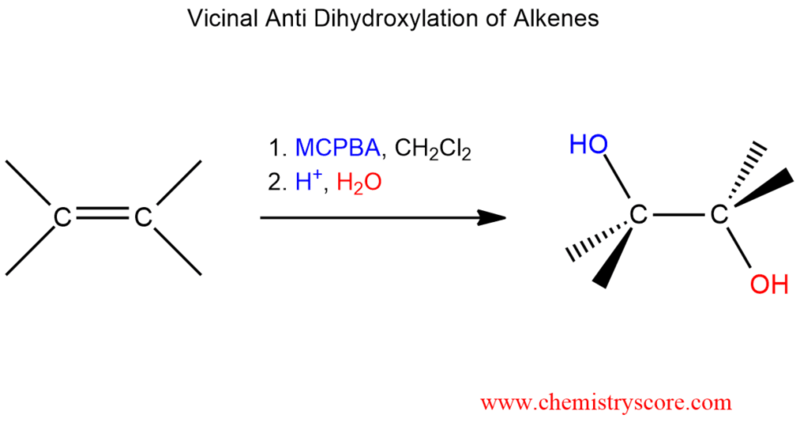 It has been demonstrated no ionic intermediates are involved in the epoxidation of alkenes. The reaction rate is not very sensitive to solvent polarity. It proceeds at room temperature in an inert solvent, such as chloroform, dichloromethane, or benzene. In epoxidation, we can write a cyclic transition state in which the electrophilic oxygen is added to the π bond at the same time as the peroxycarboxylic acid proton is transferred to its own carbonyl group, releasing a molecule of carboxylic acid, which is a good leaving group. The two new carbon-oxygen bonds in the oxacyclopropane product are formally derived from the electron pairs of the alkene π bond and of the cleaved of the oxygen-hydrogen bond. Treatment of oxacyclopropanes with water in the presence of catalytic acid or base leads to ring opening to the corresponding vicinal diols. These reactions follow the mechanism where the nucleophile (water or hydroxide) attacks the side opposite the oxygen in the three-membered ring, so the net result of the oxidation – hydrolysis sequence constitutes an anti dihydroxylation of an alkene.